Happpppppy Monday, friends!! The whole Keinsley crew has been down with various sickness for almost three weeks, but I think the end is near! I'm so grateful we're all finally feeling better, especially since the next three weeks are jam-packed full of Christmas festivities with family and friends! Despite not feeling well, I've been a little Christmas elf and have been busy decking our halls! I shared my Christmas decor inspiration last week, and am so excited to show you the final product today! It helps having pretty minimal and neutral decor to begin with, because it makes the backdrop for seasonal decor a lot easier to work with. I got rid of most of our glitzy, sparkly, and colorful decorations in favor of neutrals, greenery and more natural elements like wood and cozy textures. I absolutely love the result and it's my favorite Christmas decor yet! I ended up buying the garlands from our local Home Depot, because they were only $6 for a 25-foot strand (!!) and I wasn't sure the supplies and time to make my own was worth it! I bought the center wreath in our dining room as well, but made the two smaller ones. To be honest, I'm not sure I'll do live greenery again, at least not for the garlands. They aren't lasting as long as I'd hoped and are already significantly dried out after only ten days, and are making a huge mess of dropped needles. We don't do a live tree, so for those who do I'm sure you know this is just par for the course, but I don't think the mess and short lifespan is worth it. I think next year we'll invest in a few really lovely faux garlands and still use live greenery cuttings here and there. For stockings, I went with coordinating but not matching. In the past we've always had the generic red fuzzy ones, with our names written in glitter glue - just like I grew up with. But, I loved this inspiration image I stumbled across from Target, and absolutely loved the look, and decided to recreate it, stick an all! I knew I'd be annoyed if I did matching stockings, but couldn't find additional ones down the line as our family grows. This way, we can continue adding coordinating stockings for future kiddos. I found the stockings at Home Goods, At Home and Hobby Lobby, and added the birch slices to keep track of which was which. Another thing I switched out this year was the tree skirt. Holy cow, tree skirts are expensive! I know there are tutorials for cute, easy ones online, but with all the other DIY projects I had going on, I didn't want to go that route. I loved the idea of having our tree in a cute, vintage-inspired bucket, and also liked that the bucket could be used for other things - a little baby pool, a cooler for backyard parties, etc. I picked up this galvanized metal tub for $20 at Lowe's, which is less than half the price of the tree skirts I was finding everywhere I looked! We don't have a theme for our tree, opting for mismatched and mostly sentimental ornaments instead. Next year, I'm going to swap out the colored lights for white lights, and the tinsel for wooden beads. Christmas is truly such a magical time, and although the past week has been spent 98% at home because of a sick baby (and sick me! ), I haven't minded much. All this festive decor, yummy candles burning and Christmas music on repeat has made our house my absolute favorite place to be. You can see our 2013 Christmas tour here (our first married Christmas and the only in our apartment!) and our 2014 decor here. It's so fun to see how drastically my style has changed over the years! I hope your week is off to a great start, and thanks for stopping by! XO! Happy Monday morning, sweet friends! Although it's rainy, windy and downright dreary here today, I'm bursting with Christmas cheer. We just spent a week in Utah with Matt's parents, brother, sister-in-law and our nephew, and it was so fun to kick off the holiday season with family. On Friday night, we walked through this amazing light display, and it totally got me pumped for Christmas. Beautiful lights, Christmas music, cold toes, hot chocolate in hand, ahhhh! On today's agenda is deep cleaning the house so we can put up the tree tonight, hooray! Over the past year, I've gotten rid of 75% of our Christmas decor. I'm noticing my tastes changing significantly, away from the bright reds and greens of typical Christmas decor and more towards minimal neutrals, much more Scandinavian inspired. I also get really sad having to take down the Christmas decorations after New Years, so this year I'm aiming for more winter decor, instead of strictly Christmas decor. Of course we'll have a Christmas tree, but I plan to use lots of natural elements like greenery which will last well past Christmas, and keep our home feeling festive and cozy through those dreary post-holiday days. 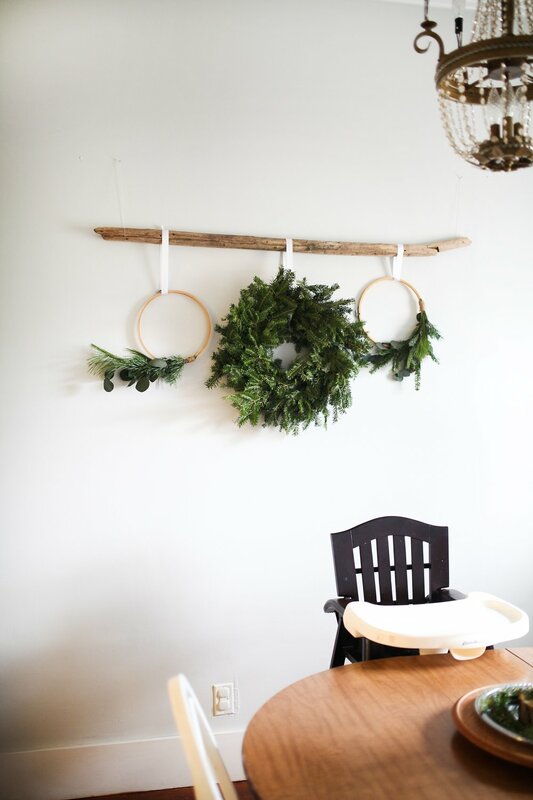 Bonus: you can get greenery for free, and there are a million tutorials online for making your own garlands and wreaths! Here's a bunch of images I've been pinning that are serving as my inspiration board. I feel happy just looking at it! I'll be back next week with photos of our decorated home - we'll see if I can pull this vibe off! What's your decorating style for the holidays? Do you go full-on Christmas, or opt for more of a "wintry" vibe? I'd love to hear!! Looking at beautiful home decor is my love language :) XO!